Chris Hadfield Canada visited Mir in November 1995 as a Mission Specialist 1 STS-74. Hadfield played guitar aboard the station. Vladimir Nikolayevich Dezhurov is a former cosmonaut who resides in Star City, Moscow. He is a veteran of two spaceflights, to the Mir and International Space Stations. During his career, Dezhurov also conducted nine spacewalks before his retirement on July 12, 2004. Yury Vladimirovich Usachov is a former cosmonaut who resides in Star City, Moscow. Usachov is a veteran of four spaceflights, including two long duration missions on board the Mir Space Station and another on board the International Space Station. During his career, he also conducted seven spacewalks before his retirement on April 5, 2004. Soyuz TM-30, also known as Mir EO-28, was a Soyuz mission, the 39th and final human spaceflight to the Mir space station. The crew of the mission was sent by MirCorp, a privately funded company, to reactivate and repair the station. The crew also resupplied the station and boosted the station to an orbit with a low point (perigee) of 360 and a high point (apogee) of 378 kilometers. The boost in the station's orbit, which was done by utilizing the engines of the Progress M1-1 and M1-2 spacecraft, made transit between Mir and the International Space Station impossible, as desired by NASA. The mission was the first privately funded mission to a space station. Pavel Vladimirovich Vinogradov is a cosmonaut and former commander of the International Space Station. As of May 2013, he has flown into space three times, aboard Mir and the International Space Station, and is one of the top 10 astronauts in terms of total time in space. Vinogradov has also conducted seven spacewalks in his cosmonaut career, and holds the record for the oldest person to perform a spacewalk. Mir was a Soviet and later Russian space station, operational in low Earth orbit from 1986 to 2001. 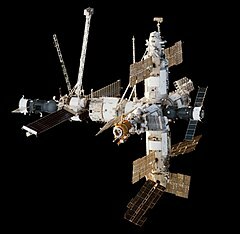 With a mass greater than that of any previous space station, Mir was constructed from 1986 to 1996 with a modular design, the first to be assembled in this way. 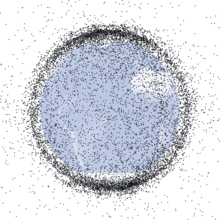 The station was the largest artificial satellite orbiting the Earth until its deorbit on 21 March 2001, a record now surpassed by the International Space Station (ISS). Mir served as a microgravity research laboratory in which crews conducted experiments in biology, human biology, physics, astronomy, meteorology and spacecraft systems in order to develop technologies required for the permanent occupation of space. 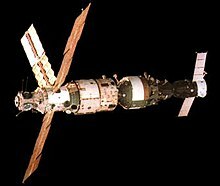 Mir was a Soviet and later Russian space station, operational in low Earth orbit from 1986 to 2001. With a mass greater than that of any previous space station, Mir was the first of the non-monolithic, third generation of space stations, constructed from 1986 to 1996 with a modular design. The station was the largest artificial satellite orbiting the Earth until its deorbit on 21 March 2001, a record now surpassed by the International Space Station (ISS). Mir served as a microgravity research laboratory in which crews conducted experiments in biology, human biology, physics, astronomy, meteorology and spacecraft systems in order to develop technologies required for the permanent occupation of space. The Stykovochnyy Otsek, GRAU index 316GK, otherwise known as the Mir docking module or SO, was the sixth module of the Russian space station Mir, launched in November 1995 aboard the Space Shuttle Atlantis. The module, built by RKK Energia, was designed to help simplify space shuttle dockings to Mir during the Shuttle-Mir programme, preventing the need for the periodic relocation of the Kristall module necessary for dockings prior to the compartment's arrival. The module was also used to transport two new photovoltaic arrays to the station, as a mounting point for external experiments, and as a storage module when not in use for dockings. Kvant-1 (37KE) was the first module to be attached in 1987 to the Mir Core Module, which formed the core of the Soviet space station Mir. It remained attached to Mir until the entire space station was deorbited in 2001. Mir EO-4 was the fourth long-duration expedition to the Soviet space station Mir. 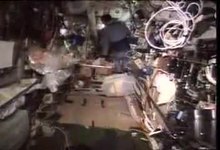 The expedition began in November 1988, when crew members Commander Aleksandr Volkov and Flight Engineer Sergei Krikalev arrived at the station via the spacecraft Soyuz TM-7. The third crew member of EO-4, Valeri Polyakov, was already aboard Mir, having arrived in August 1988 part way through the previous expedition, Mir EO-3. Mir EO-19 was the nineteenth manned expedition to the space station Mir, lasting from June to September 1995. The crew, consisting of Russian cosmonauts Anatoly Solovyev and Nikolai Budarin, launched on June 27, 1995 aboard the Space Shuttle Atlantis on the STS-71 mission. After remaining aboard Mir for approximately 75 days, Solovyev and Budarin returned aboard the Soyuz TM-21 spacecraft on September 11, 1995. Mir EO-8 was the eighth manned expedition to the space station Mir, lasting from December 1990 to May 1991. The crew, consisting of Russian cosmonauts Viktor Afanasyev and Musa Manarov, launched along with space journalist Toyohiro Akiyama on December 2, 1990 aboard Soyuz TM-11. Akiyama returned aboard Soyuz TM-10 with the outgoing Mir EO-7 crew on December 10. Afanasyev and Manarov returned aboard Soyuz TM-11 on May 26, 1991.